Twisted Bread is the name of a very simple wheat bread from Switzerland. Swiss Wurzelbrot is a loaf that has been twisted two or three times around itself, giving it a bumpy shape like a tree root. 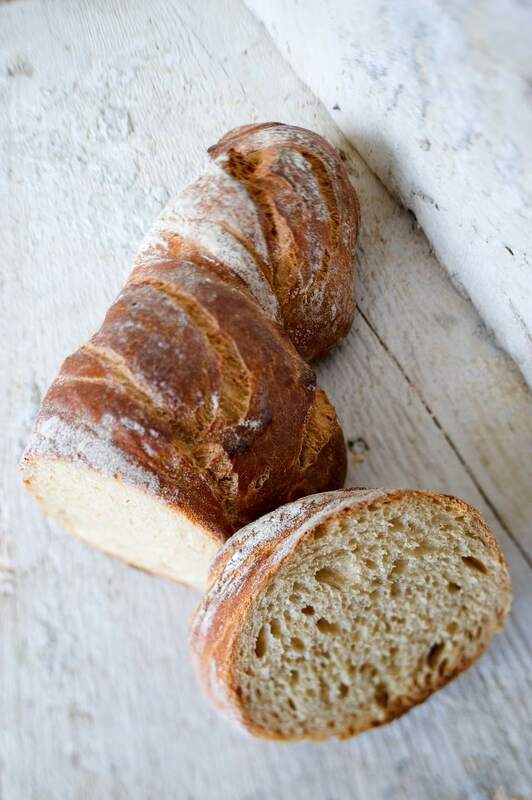 Because Wurzelbrot has a long rise in the refrigerator, many of the starches are converted to sugars which caramelize when baked, creating deep, nuanced flavors. Turn out onto a lightly floured board and knead with a standing mixture for 5 to 10 minutes (if you want to knead by hand, use wet hands, so no further flour is added), adding a little more flour as needed, to keep dough from sticking to everything. Place dough into oiled casserole dish and place that in a clean plastic bag, such as a garbage bag. Twist tie the top and place in refrigerator for 12 to 24 hours. Preheat oven to 500 F. Place an old aluminum pan on the bottom rack and your baking rack on the next level up. Remove dough from bag and casserole and place on floured board, turning once to coat. Do NOT knead. Using a sharp utensil (bench knife or razor), cut into two pieces, lengthwise. Take a hold of the two ends and twist them (as if you are wringing out a towel) twice. Place on baking tray or cookie sheet lined with parchment paper. To bake, place cookie sheet in the oven, pull bottom rack with old pan out and pour about 2 cups of water into it. Close quickly. If you have a spray bottle with water, open oven after 3 and 6 minutes and give 10 quick squirts onto the walls of the oven. Turn oven down to 450 F after that and bake for 20 to 25 more minutes, or until internal temperature of the bread reaches at least 190 F.